You’re Ready for Winter – But is Your Roof Ready? https://tdhomepro.com/wp-content/uploads/2018/11/house-in-the-snow.jpg 776 970 Grace Sovine http://tdhomepro.com/wp-content/uploads/2018/08/TD-Main-Logo-125.png Grace Sovine2018-11-19 15:06:592018-11-19 15:06:59You’re Ready for Winter - But is Your Roof Ready? Where Do Roof Leaks Come From? Your alarm clock goes off. You stumble to the bathroom, turn on the shower and walk over to grab your towel. As you look up you see a murky brown stain on the ceiling. Before you went to bed storms had rolled in and it rained all night. Now you notice a new spot on the ceiling you have never seen before. Well chances are, your roof system has some sort of leak and surprisingly enough it has probably been an ongoing process. The intense storm just revealed what had been forming for sometime. The sun in NOVA is strong. A few years ago a buddy of mine called and said he noticed a stain in his bathroom ceiling. The first thing I said was it is probably a pipe collar. In Northern Virginia, there is obviously cold winters and hot summers. 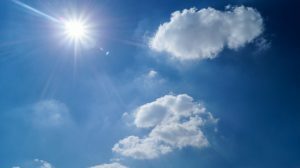 The changes in weather, coupled with sun and humidity can cause roof components like pipe collars to age quickly. An old, worn down, aging pipe collar can crack, allowing moisture to penetrate your roof. Typically, when there is a roof leak, the cause is often the pipe collar or the vent stacks – the pipes that vent from different areas of your home. Fixing a pipe collar is an easy repair for your homes roof. 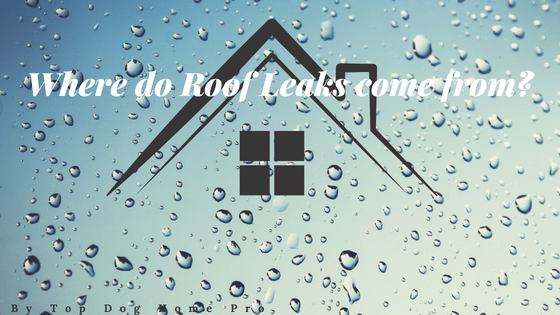 But that isn’t the only way a roof can leak…. A roof system as a whole as many working components. The goal for your roof system is to seal your home off, defend it from the elements, while allowing for ventilation. As you can see from the list above, a leak can come from many areas. While a properly installed roof shouldn’t have any leaks, awareness is key. Would you like to learn how Top Dog Home Pro separates itself from the rest?Learn about our trusted roofing process here. A newly installed roof by Luke with Top Dog Home Pro takes into account all the possible issues a roof might have. Top Dog Home pro uses a Permaboot which is made in the USA. Additionally, permabootsare designed to protect the area around your roofs pipes for 50 years. Virginia code requires ice and water shield, which we use on every roof. Top Dog also installs drip edge at the gutter line on all roof edges and like mentioned above, we never use/never will use aluminum ridge vents. Considering these potential problem areas ahead of time ensures a higher quality roof. Not to mention the 10 year labor warranty and CertainTeed lifetime product warranty. So if the weather has hit your home and you live in Woodbridge, Manassas, Lake Ridge and the surrounding areas, simply reach out to us here or on our Facebook Page. Have a great day & thanks for reading! https://tdhomepro.com/wp-content/uploads/2018/08/rainy-roof-590c97bb10183.jpg 667 1000 Dan Craddock http://tdhomepro.com/wp-content/uploads/2018/08/TD-Main-Logo-125.png Dan Craddock2018-08-24 02:14:132018-08-24 02:18:02Where Do Roof Leaks Come From?